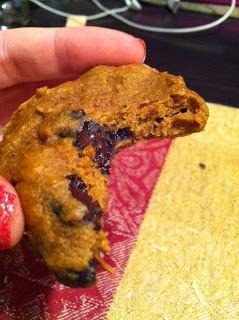 Sweet potato chocolate chip cookies- these may be the best healthy clean eating cookie I have ever had! They are moist and soft just the way I like my cookies. The sweet potato acts as a natural sweetener and the addition of nut butter gives them a richness I love. You will need: baking pan, parchment paper, large bowl, food processor, medium pot, mixing spoon. 1. Boil a medium pot of water. Peel and dice sweet potatoes, add to water. Cook till they can be easily forked. Once they are done add to the food processor and pulse till smooth. Let cool. 2. Mix dry ingredients- oat flour, spices, baking soda, baking powder, and salt. Cut in the nut butter with a fork or a pastry cutter if you have one. I ended up using my hands. 3. Add eggs, maple syrup, and vanilla. Mix in sweet potato and then chocolate chips. 4. Scoop onto parchment paper or foil lined baking sheet- I used a mini ice cream scooper. Then press down with a fork. These cookies will not disappoint. The sweet potatoes, spices, and chocolate are a decadent combination.